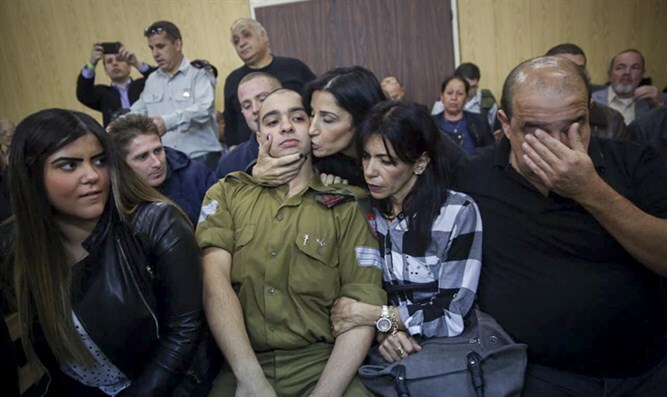 In unusual move, soldier convicted for shooting wounded terrorist to spend holiday with his family, then return to prison. Elor Azariya, the former IDF soldier convicted of manslaughter for shooting a wounded terrorist, will be released from prison for a temporary furlough for the Rosh Hashanah holiday, Channel 20 reported. According to the report, Azariyah will leave the prison at 8 AM tomorrow (Wednesday) morning, and will return to prison by 9 AM Sunday morning. Soldiers are usually only granted furloughs from prison after serving a third of their sentence. Azariya began serving his 18 month sentence only last month. Azariya's lawyer, Yoram Sheftel, said that for the first time since the beginning of the affair, the IDF's enforcement authorities treated his client fairly. "Let us hope that this is a swallow which heralds the arrival of Spring and a significant relief from the army's punishment."